Ex-footballer George Weah has been elected to the highest office in Liberia. But will he be equal to the country's many challenges, asks Umaru Fofana. On the highest point of Monrovia are the remains of what used to be an impressive five-star hotel - DUCOR. There stands the black-and-yellow statue of Joseph J Roberts, the country's first president, overlooking the city. The founding president would have glowed with pride at what has just taken place in Liberia - the key step towards the first transfer of power in the country from one elected president to another through universal suffrage. Just outside Liberia's election commission crowds gathered to celebrate the announcement that George Opong Weah had won the run-off. A young man, without a shirt on, looked teary-eyed. He summed up the mood. An aide to the president-elect said he shed tears after hearing the news. Hardly anyone is surprised at this victory. But the crushing margin could have stunned even the staunchest supporters of the former Fifa World Player of the Year. Yet Mr Weah now faces his hardest battle yet. He might know how to score a goal on the pitch, but he has only been a senator for three years. Apart from that, he's not a tried and tested political figure. Perhaps if he'd been allowed to contest for the presidency of the Liberian Football Association when he wanted to do so in 2004, there would have been something to assess his leadership with. And now he is running Liberia, a country which endured a brutal civil war for 17 years, started by Charles Taylor almost exactly 28 years ago, on Christmas Eve in 1989. Taylor would later become president, eventually forced to stand down amid a huge international pressure following his indictment for war crimes and crimes against humanity committed in neighbouring Sierra Leone. He is currently serving a 50-year jail term in a UK prison following his conviction. So it might surprise some that Mr Weah's vice-president will be Jewel Howard Taylor, the warlord's ex-wife. Is ex-warlord Taylor pulling Liberia's election strings from prison? But while her selection proved controversial, supporters of the senator say she merits it and is academically sound and experienced for her new role. In fact, George Weah did a lot of political horse-trading to get here. Not only with Mrs Taylor but also with a former warlord, Prince Johnson who butchered the war-time president, Samuel Kayan Doe. Satisfying those interests will prove key for the new president. What's more, having secured 38% of the vote in the first round, he needed to do deals to make himself - and not his rival - the choice for the other 18 candidates who couldn't make it to the run-off. Even the running mate to Charles Brumskine, who came third and went to court to stop the run-off, endorsed Mr Weah, going against his leader's position. It's not clear who will get appointed to what position but usually reliable sources say the traders are more and bigger than the horse. 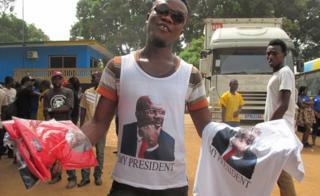 Another reason for Mr Weah's win could be because of the man he ran against. For 12 years Joseph Boakai has been Liberia's vice-president. And for decades the 73-year-old was a civil servant. He and his supporters touted his experience as his assets. His critics cited his age as his undoing. Whether it did or not may never be entirely clear. However, he and President Ellen Johnson-Sirleaf have overseen a period of remarkable stability in the country, after all the wars and woes. But Mr Weah takes control of a Liberia where corruption is believed to be endemic, poverty is rife and the economy is weak. Fixing the economy of a country with huge natural resources including a large rubber plantation, iron ore and the prospect for oil will be crucial. And with that, providing jobs for especially the young people who comprise the majority of the population. This requires well thought-out policies and foreign assistance. The head of the election observer mission of the regional block Ecowas has urged the world to assist Liberia. Ghana's former President John Mahama has called on "the international community to provide the country with more support". Liberia has been a pioneer on the continent. As its first independent republic, it produced its first elected female president, its first winner of the coveted individual football award, and now its first former footballer president. The teary-eyed young man needs a job to wipe his tears off. As the towering statue of President Roberts continues to watch, Liberians will ask themselves whether the euphoria was worth it.